Fillon to be the knight in shining armour to save the Commission? Sarkozy and others hence have the ideal line to take. There are leaders on the right that are not especially keen on Barroso but have been bound into a pact to back him. If the European Parliament can then do the dirty work to not approve the Portuguese then everyone wins. The problem of course is that such an approach would change the institutional balance. In the future the European Parliament could theoretically be brave enough to keep rejecting the nominee for President until it got the candidate it wanted. Strengthening the EP in this way would be a rather unusual (and in my mind positive) by-product of centre right leaders not being ready to entirely back Barroso. What about the left though? Surely Zapatero, Socrates and Brown want Barroso because he is weak. 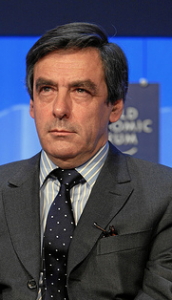 Fillon is from the right and would also be stronger… How would the ‘leftist’ Prime Ministers react? Anyway, all of this is probably just lazy speculation. The EP will probably show about as much backbone as it has in recent times (i.e. none) and just go ahead and approve Barroso. The Economist has more on this – written much more eloquently. And Jean Quatremer has been stirring up feelings against loss of French influence with regard to Commissioners’ cabinet chiefs (and cabinet posts; the latter seem to tally exactly with the proportion of French inhabitants relative to the total EU population).